If Robert Louis Stevenson had lived long enough to see his creative flair dispatched into the mighty cosmos, he would have undoubtedly been overjoyed by any result. But in the latest Disney animated feature, the ambitious and exciting "Treasure Planet," the compelling scope of his most unforgettable written work is set against one of the most bright and rousing canvases seen in standard feature animation since "Titan A.E. ", a look that doesn't simply flood the screen with its color and energy, but pulls the viewer into the experience. This isn't a product in the grand tradition of the best Disney cartoons, mind you, because it follows no tradition but its own. Like last year's "Atlantis," only on a much wider scale, the movie is in complete awe of itself, devised from no direct pattern or formula, and yet crafted with the most essential pleasures in mind. Those who are familiar with the original literary work know the mark of great storytelling; in a long, intricate list of achievements that stretch throughout the writer's brilliant 44-year life, Stevenson's stories helped sculpt (and even reshape) the essence of young adult fantasy, their wildly adventurous tones captivating readers of every generation without even trying that hard. Many of his larger works are taught to a variety of ages in classrooms, but it is "Treasure Island" that holds the dubious honor of being his crown jewel, its bright characters and themes jumping off the pages with the utmost ease and carving a permanent place among our fondest literary memories. Taking that prospect to a level beyond anything seen in the genre, directors Ron Clements and John Musker, who last collaborated on the 1997 Greek mythology comedy "Hercules," seamlessly weave this substance into a dimension where elements of the past and the future collide with striking force. 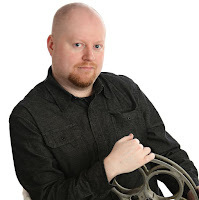 Most films adapted from Stevenson's work can get away with including the swashbucklers, the pirate ships and even the hidden treasures, but few (if any) of them would know how to pit them against the elements of science fiction. 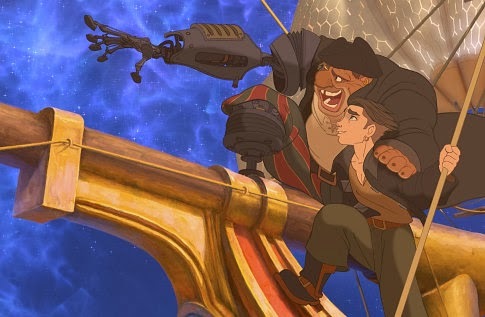 Surprisingly, "Treasure Planet" leaps from those constraints without even breaking a sweat--adventure-seekers, buccaneers and scoundrels of all kinds jump aboard large decorated vessels in search of wealth on distant worlds, seemingly unnerved by the fact that their journey will take them among star systems rather than the high treacherous seas. The movie opens, almost instinctively, from the hero's own childhood dreams. Little Jim Hawkins (later voiced by Joseph Gordon-Levitt) skims through the pages of a bedtime storybook(their images jumping out like animated pop-ups) and listens to the story of the infamous 'treasure planet' being told to him. A world, the book tells us, in which riches from galaxies wide and far were collected and stored for the notorious pirate Captain Flint,Jim drools in excitement as the legend is described in vibrant detail, his eyes big and focused like those of a rodent closing in on a bread crumb for feasting. He repeats the story incessantly despite his mother's warnings ("it's just a story, Jim! "), but when he grows into a man, it has already made a lasting impression on his attitude towards life. He's adventurous, rebellious, sly and misunderstood down to the very last detail, and when a mysterious turtle drops dead in his mother's inn clutching a device that contains the map to the authentic treasure planet, he doesn't have to think twice about setting out to find it (especially since unseen others are looking for the map itself). To help in his somewhat-premature venture, the movie supplies him (and us) with a rousing cast of supporting players. There is, for instance, the eccentric but wise Dr. Doppler (David Hyde Pierce), a psychiatrist who goes along with Jim more for the prospect of visiting new places rather than finding riches, and Captain Amelia (Emma Thompson), a feline-like being (I'm guessing) who tops her wickedly-amusing conversation with some of the most quirky facial expressions seen this side of "Shrek." Comic sidekicks, meanwhile, have always been an essential ingredient to the Disney legacy (even in films that stand outside the norm), and "Treasure Planet" fulfills that gap via Morph, a small shape-shifting creature who looks like a chewed gum ball, and B.E.N. (Martin Short), a wisecracking robot who was abandoned on the treasure planet centuries before with his memory chip stolen. Readers of the original story, needless to say, will instantly be acquainted with the movie's version of the wickedly likable John Silver (here voiced by Brian Murray), but few of them would have expected the relationship between him and young Hawkins to be so well established. Their intricate, rocky bond is the immediate center of this film, not the typical love story that even "Atlantis" was unable to avoid. The familiar technique that "Treasure Planet" is built around—hand-drawn characters placed onto computer-fueled backdrops—is one that the Disney name has gradually been detaching itself from; thanks to the success of CGI and its equivalents, studios like theirs are now depending on entirely computer-animated releases to push the creative envelope (not to mention the extensive commercial appeal). But should that keep them from revisiting the initial style that gave birth to animation in the first place? Not really. While the slyness and layered wit of films like "Shrek" and "Monsters, Inc." clearly take the prize in terms of complimenting the modern advances of animation, there is still much that has yet to be discovered in the basic cartoon realm. An astonishing endeavor like this is the ideal example; computers may be capable of tearing down the walls previously thought unyielding, but could they truly imagine an adventure on the epic scale of something like "Beauty and the Beast" or "The Lion King?" When "Treasure Planet" was unfolding before my entertained eyes, I knew I was seeing a solid screen adventure, but I had no idea that it would so captivate and enthrall me on every possible level in the end. Not since "Mulan" (or, quite possibly, even "The Hunchback of Notre Dame") has there been a Disney cartoon so casual about its own brilliance and grandeur; when it sets out to retell the story, it never once dawns on us that we'll be seeing Stevenson's unforgettable literature take shape through the flawless use of a future-inspired locale. In fact, by the time it all sinks in, we're too engaged to even care that old pirate ships are gliding so effortlessly in the high starry skies.